AFTER Cyprus, I was planning to go to Iran. But I wasn’t just going to fly into Teheran. I wanted to go overland via the western Iranian city of Tabriz, like the hippies used to. That meant going back to Turkey, with the prospect of more adventures on the way. Above all, I planned to climb Mount Ararat, the national mountain of Armenia, though it is just inside the Turkish border these days. Mount Ararat is at a triple point where Armenia, Turkey and Iran all meet. Climbers mostly set out up the southern sunny face of the mountain from a town called Doğubeyazıt. 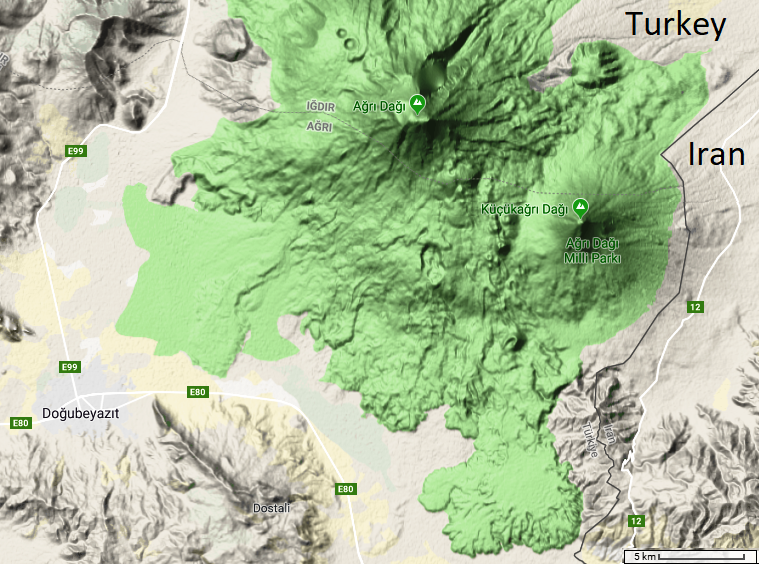 Terrain map of Mount Ararat and environs, with country names and scale added. Map data ©2019 Google Maps. Mount Ararat is a dormant volcano with two peaks. Its highest peak, called Ağrı Dağı in Turkish, is 5,165 metres high, or nearly 17,000 feet. The lower peak is a prominent, symmetrical cone known in Turkish as Küçükağrı Dağı in Turkish and ‘Little Ararat’ in English. At 3,925 metres or nearly 13,000 feet, Little Ararat is higher than Mount Fujiyama in Japan, though it doesn’t stick up as far above the surrounding landscape. It is only little compared to Ararat’s main peak! Here's a link to a 3D rotating image of Mount Ararat, which is unfortunately too big to upload to this post. 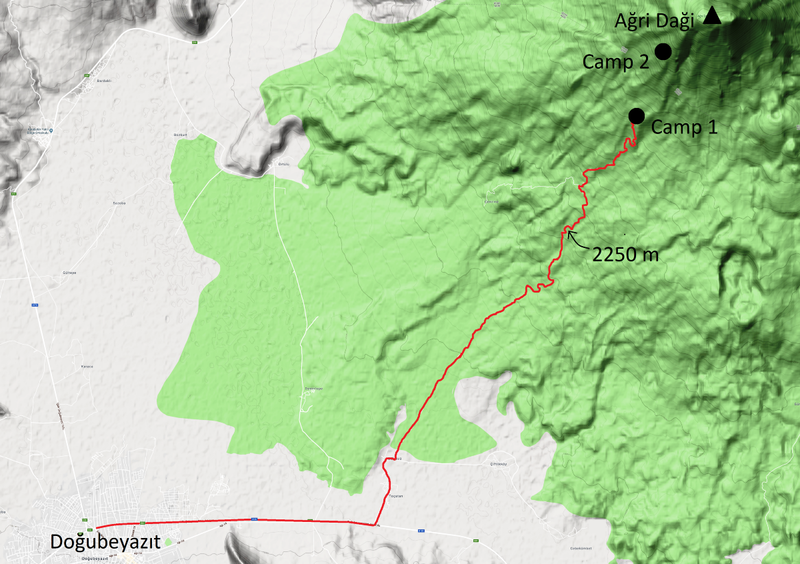 The first recorded ascent of Ağrı Dağı took place in 1829. The last recorded eruption took place in 1840, possibly at the same time as a major earthquake. Mount Ararat is also the legendary last resting place of Noah’s Ark. So the story goes, the Ark made landfall somewhere on Mount Ararat as the waters of the biblical Flood began to recede. People have spent a lot of time and money looking for the Ark on Mount Ararat as a result. Mount Ararat (circled) and neighbouring countries. Scale, red circle around Mt Ararat and some country names added, along with all text pertaining to Kurdistan. North at top. Map data ©2019 Google. The Kurds, who are perhaps the most numerous people in the region — about as numerous as the Canadians, some 36 million or so — don’t have an internationally recognised country at all. 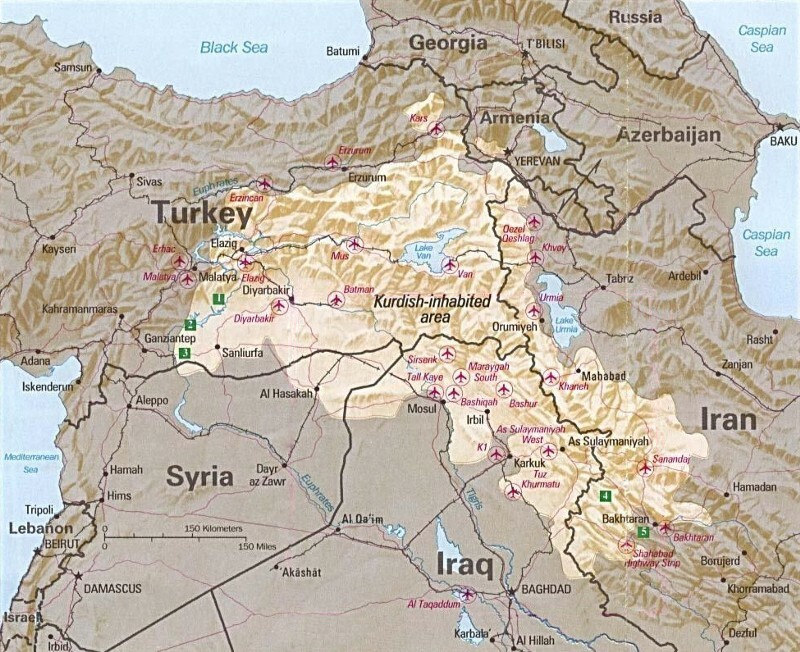 Instead, the Kurds are divided between Turkey, Iraq, Syria and Iran, with a handful in Armenia as well. 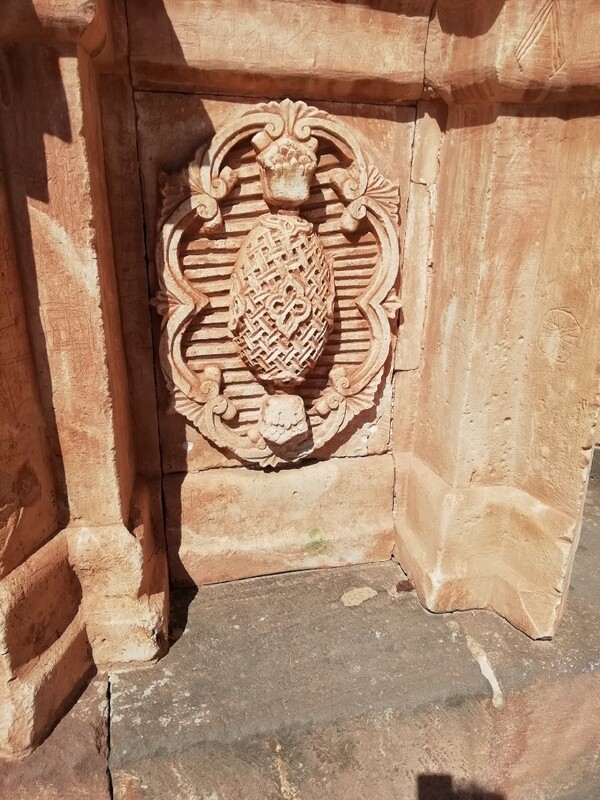 Most are actually in Turkey, in a region roughly centred on Lake Van and the lakeside city of Van, which is about 150 km southwest of Doğubeyazıt. The ‘Kurdish-inhabited area’ as of 1992. Public domain image by the CIA (1992), via the Perry-Castañeda Map Library and Wikimedia Commons. The area around Mount Ararat has long been a trouble spot for national and ethnic rivalries. 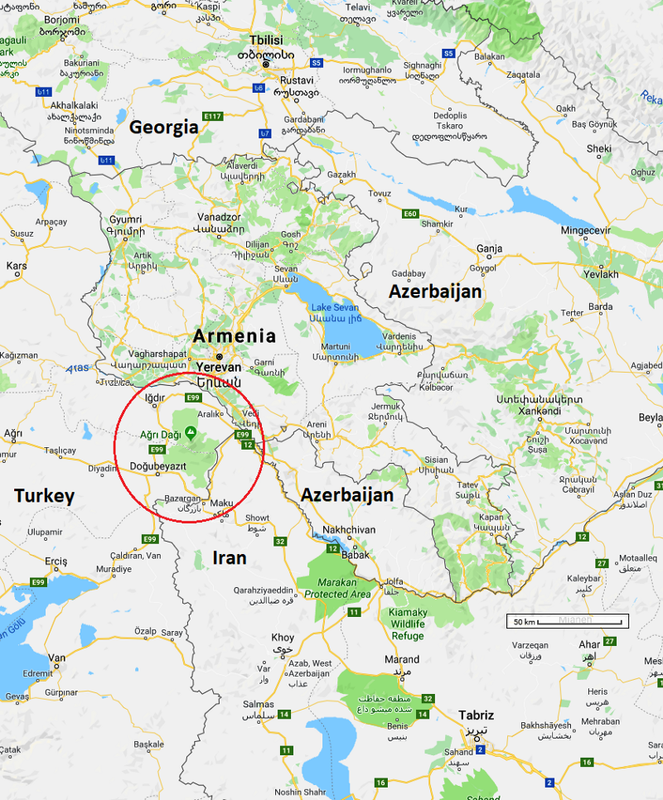 The border between Armenia and Turkey has been closed since 1993 because of a long-running border dispute between Armenia and Azerbaijan. Turkey takes the side of the Azeris, as people from Azerbaijan are known. The Turks have also been fighting a long guerilla war against a Kurdish separatist group called the Kurdistan Workers’ Party or PKK. 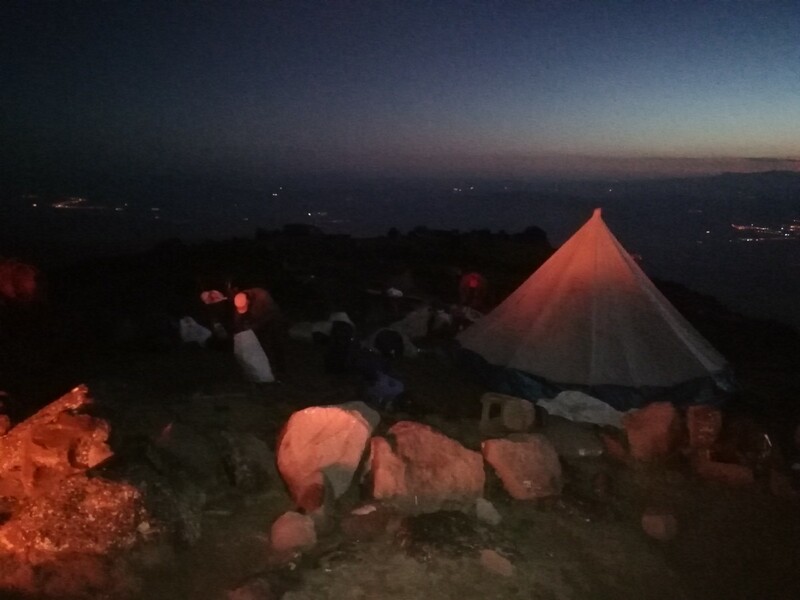 Because of the PKK insurgency, Mount Ararat was closed to climbers in 2015, and was only re-opened a few weeks before I went up! The international mountaineering community had requested that it be opened. I booked my Mount Ararat trip with a local trekking firm a few weeks beforehand, which is important for getting permits. 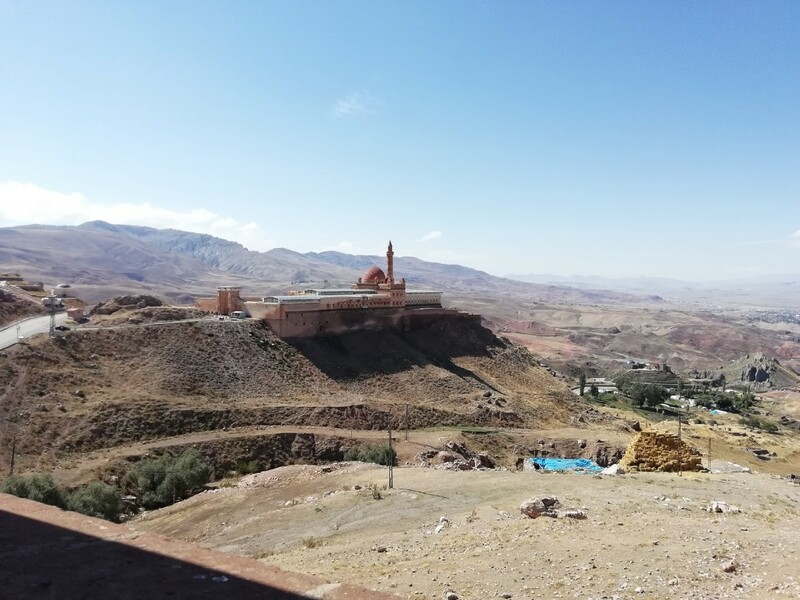 I arrived at Van Airport in early September, 2018, and was driven to Doğubeyazıt, an old historic town which was for a long time the main Persian (Iranian) border crossing in the region. Doğubeyazıt has also prospered more recently from tourism, mountain climbing and skiing on Ararat, a mountain that offers 2,103 metres of vertical descent to skiiers. I stayed in a really good hotel for only US $20 a night. The people in Doğubeyazıt had suffered quite a bit during the mountain closure, and must have lobbied hard for its re-opening; President Erdoğan himself had visited recently. 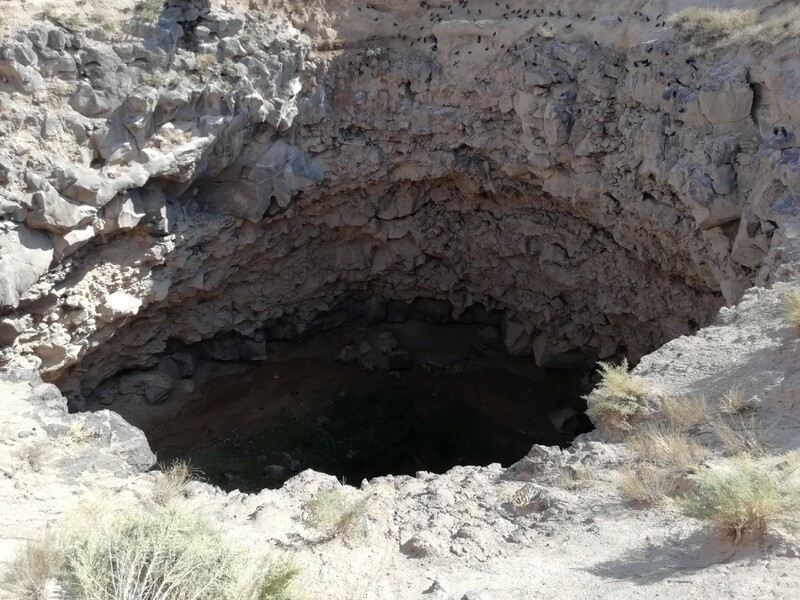 While I was there, I also went to see an alleged meteor crater. This looked more like a volcanic crater and probably is; there is no record of a meteor crater here in the Earth Impact Database. Still, it’s pretty spectacular. You can just see some pigeons on the far wall of the crater. The people from Doğubeyazıt also claimed that the actual spot where the Ark had supposedly run aground was nearby, and not on the very top of Mt Ararat as some people think; and I went to see the supposed site of this as well. You can certainly see the outline of what looked like a boat. The site had a museum next to it but because of the lack of tourism and the military crackdown, the museum had no visitors. I heard of a recent expedition that thought it had found the Ark on Mount Ararat, based on carbon dating of the wood they turned up. But they wouldn’t say where where it was for fear the Turkish government would come and blow it up, or something like that. According to a National Geographic article from a few years back, such people are fooling themselves, particularly so given that the Bible doesn’t actually say that the ark wound up on Mount Ararat in the first place! Not many women went out at night in Doğubeyazıt; it seemed quite a conservative area. Many of the Turkish men had Iranian wives, who seemed to marry Turks in order to get out of Iran. The people quizzed me on my views on the conflicts in the area, and I said I didn’t have any! On the way to the crater I went through a Turkish military checkpoint, where the soldiers checked what was on our cameras. Luckily I’d only taken photos of the natural scenes and not the checkpoint itself! There had been more checkpoints in the area, I was told, but the PKK had destroyed a number of them and they hadn’t been re-established. A map of the route up. Image background ©2019 Google Maps, north at top. After Doğubeyazıt, it was time to climb the mountain. Climbing Mount Ararat is basically a trek rather than a technical mountaineering exercise, and we also had pack-horses that carried out baggage. I’d never been on a hiking trip where horses carried the burden! There were about six of these horses on our expedition, and they carried 60 kg each. That’s a lot of stuff by the standards of you and me but still less than the weight of the average rider. So, I don’t think the horses were overburdened. And neither were we. On the other hand, I was a worried about my acclimatisation, as the mountain is seriously high. This was an issue I’d run into the Himalayas, already, where people generally took many days to get to the same altitude as the top of Mount Ararat. 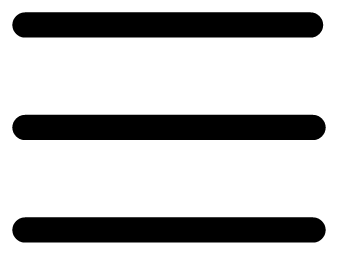 At 5,000 metres there is only about half as much oxygen as at sea level. If you go straight up to such a height and try to hike all day, bad things will happen. We teamed up with another party consisting of a Japanese guy and two Czech climbers. The three had their own guide, and I had my own. After one night in Doğubeyazıt we were driven to an altitude of 2,250 metres from which we hiked along a trail to Camp 1 at an altitude of 3,200 metres. This was mostly a matter of walking up a hillside of dry grass. We were supposed to spend two nights at Camp 1 for acclimatisation but only spent one night, because, on the first night, Camp 1 was attacked by an Asian Brown Bear. This is an animal that is of the same species as a North American Grizzly and for all intents and purposes the same. If anything, it’s bigger. The kitchen tent was taken out and the other guide and the cook slept outside. They didn’t want to sleep in the kitchen tent in case the bear came back. At 2 am the cook and other guide yelled “the bear’s here, the bear’s here” and my guide went outside and shot a rifle in the air a few times to frighten the bear away. 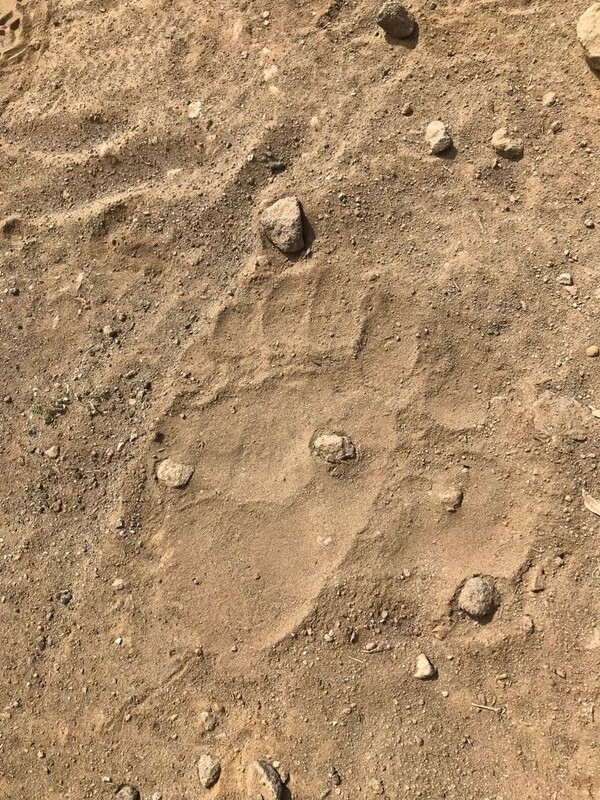 I took photos of the bear prints, they were huge, the size of yetis! There were bottles of poison at Camp 1 which people had apparently used to poison meat to repel or kill the bear. They were pretty desperate. I got no sleep because of the bear, that’s for sure. The food was really good, they really made an effort. And also, this was the first time I’d trekked with horses, which was really good too. So, we couldn’t sleep at Camp 1 the next night for fear the bear would come back. Instead, the very next day we pushed on to Camp 2 at 4,200 metres, which was a trail-less hike up through bare rock at this time of year. The next day, if everything went to plan, we were to press on up through permanent snow and ice to the summit, starting at 2 am. After that we would come down and ultimately spend another night at Doğubeyazıt. When we got up to Camp 2, at about 3 pm, there was this big “whoosh.” The Japanese guy turned around and jumped and said “what was that,” and the other two said “what was that” as well. My guide told me that it had been a PKK rocket aimed at one of the checkpoints; but the others were told by their guide that it was an avalanche, and that was the story I stuck to in their company as well. 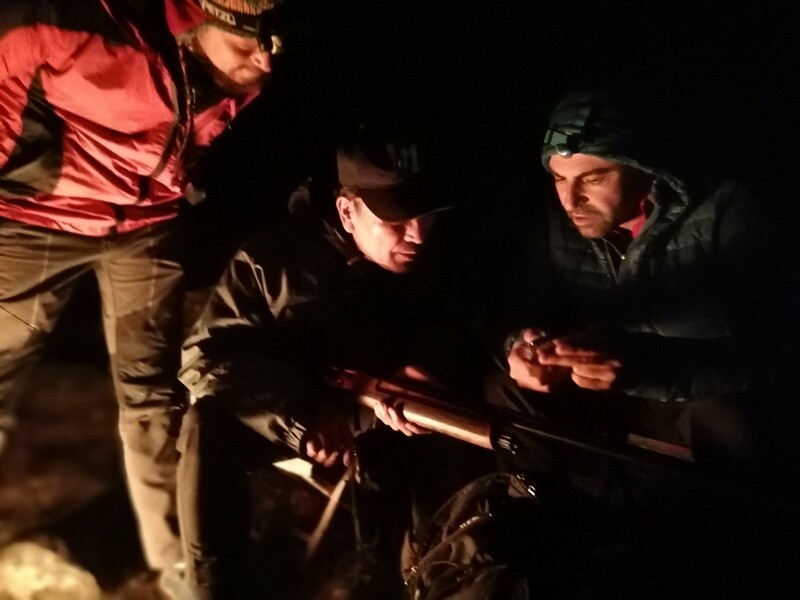 Later on I heard that the guides had to bribe the PKK at a rate of US $70 per climber to be unmolested, and also to pay the Turkish military US $50, though that might have been a bit more official. At Camp 2, I was really tired and knew that I wouldn’t be able to go further. One of the Czechs also had terrible mountain sickness from lack of acclimatisation, and couldn’t go any further as well. 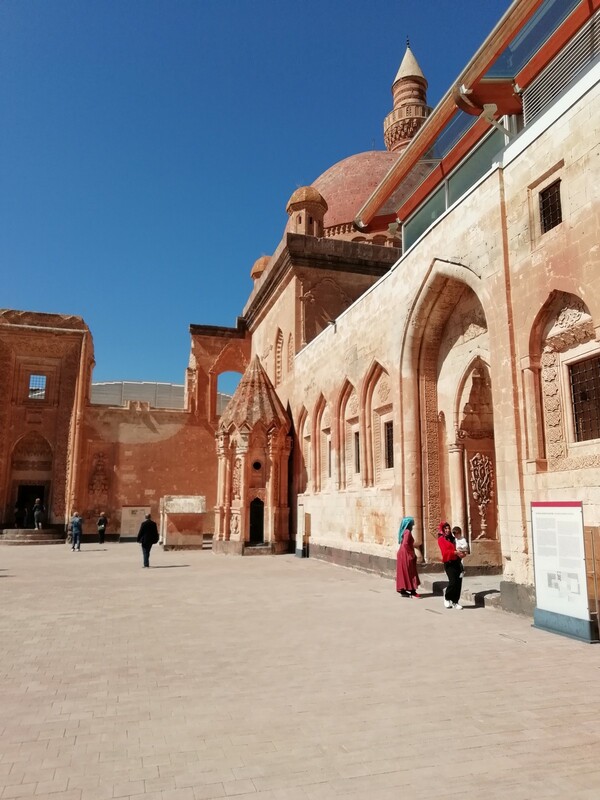 My guide was also told that if he kept on climbing he would have health problems, because he smoked cigarettes and could get blood clots or brain damage. All the same, he went on to the top, while I waited for him to come back down. Afterward, we all went back down to Doğubeyazıt, to eat and talk about local matters further. This is the first of two posts about the region centred on Mount Ararat. The second is on its way!